← balsamic skirt steak with roasted tomatoes. The inspiration for this particular meal came from a trip to South Carolina. This past spring when I visited, Crist and I went to dinner one night, and I ordered the restaurant’s special pizza of the day – a pizza that contained balsamic roasted mushrooms, something I KNEW I couldn’t pass up! I mean, we’re talking about two items that are at the VERY TOP of my favorite foods list – pizza, and balsamic vinegar. It was just as delicious as I imagined it would be, and has since lead to quite a few recreations at home – and will surely lead to many more! There will be a couple small recipes within this larger recipe, so this post might get a little lengthy… but hang in there, because all of the methods I’ll explain can be used in lots of other dishes! 1.) Start by your oven to 475° or 500°, depending on how high your oven will go. Then begin forming your dough. Personally, I don’t use a pizza stone, or a round pizza pan – I just use a jelly roll pan. I mist the pan lightly with my olive oil spritzer, and then stretch my dough to the thickness and size I want. 2.) Next, add your sauce. I like to use just a thin coating, so the pizza isn’t weighed down by too much sauce. I generally end up using whatever pasta sauce I have in the house – I’ve used basic marinara, vodka sauce, garlic and basil, etc etc. Whatever you have on hand is just fine. 3.) Evenly distribute your mushrooms and onions around the pizza (it’s a little messy, but it’s easiest to do this with your hands). Sprinkle red pepper flakes over the toppings. 4.) Cover your toppings with cheese (you grated your own cheese, right??). I prefer to put my toppings under the cheese (unless it’s something I want to get crispy in the oven, like pepperoni – that stuff I’d put on top of the cheese), so that the cheese has a chance to get all nice and brown and bubbly. 5.) Sprinkle your grated parmesan over the top of the pizza. If you have an olive oil spritzer, use it to lightly mist the exposed edges of the crust, as well as the cheese. This will help the edges of your crust crisp and brown, and it’ll help your cheese brown, while keeping it moist. 6.) Pop your pizza into the oven for about 10-12 minutes, keeping a close eye on it. When the crust is brown, and the cheese is browned and bubbly, it’s ready! 7.) 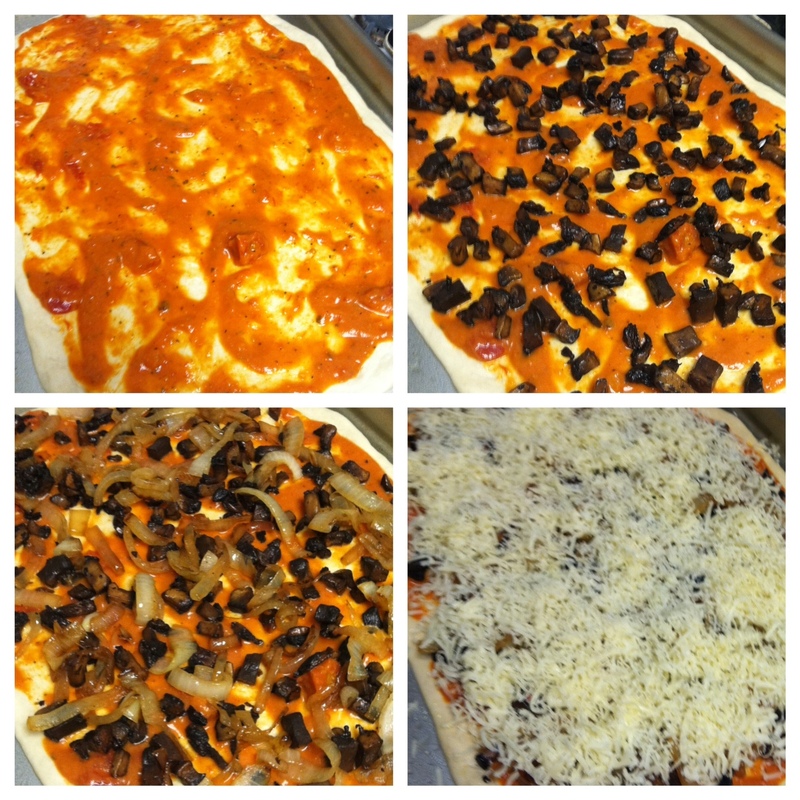 Let the pizza rest for a few minutes, so the cheese can firm up a touch. I cut mine with kitchen scissors, because I have yet to find a pizza cutter that a.) works, and b.) doesn’t make me nuts! This recipe is the best I’ve found in my experimenting over the years. One recipe makes a pizza that is perfect in size for me and my husband, the bottom gets crispy (but the crust edges are still soft inside), and it doesn’t require any funky ingredients or an exceptionally long rise time. Works for me! 1.) 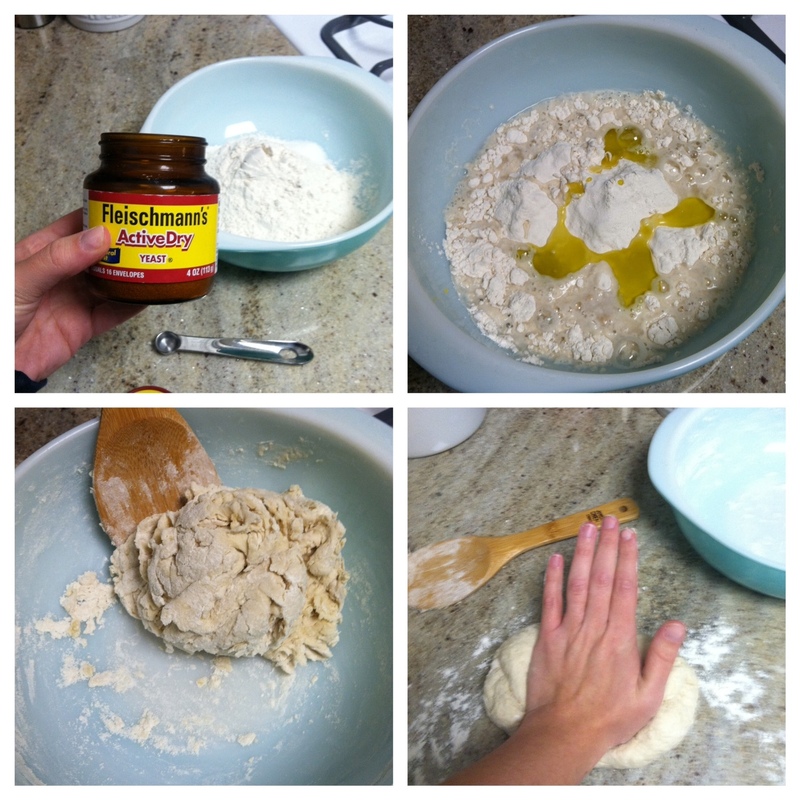 Place flour, salt, and yeast into a bowl, and whisk together. 2.) Add olive oil and water, and mix until a shaggy clump forms. 5.) When your dough has risen, take it out of the bowl, and place it onto a lightly floured countertop. Gently fold it onto itself a couple times to press some of the air out. Form it into a nice ball shape, and leave it on the counter – covered in plastic wrap – for 15-20 minutes, to rest. 6.) After 15 minutes or so, your dough should be ready for stretching! I usually start by thinning out the center of the ball of dough – pressing my thumbs into the middle to spread it out, and pushing the extra dough to the edges. I keep doing this, working farther out from the center, pushing the extra dough outwards, until my dough is almost the size I want it. (Be careful to be gentle with your dough – you don’t want to handle it TOO much and overwork the gluten. If it’s getting tough to work with, stop, cover the dough with plastic wrap or an upside down bowl, and walk away for 5 minutes. The dough should be much more forgiving once it’s had a few minutes to rest.) When it’s almost the size I want, I put it onto my jelly roll pan that I’ve lightly misted with olive oil, and stretch it the rest of the way. If you accidentally tear a hole in it, don’t worry – just smoosh it back together! 7.) When you’re done stretching your dough, top it, bake it, and serve it! You can use this dough to do all kinds of things – you can make calzones, you can make little pizza pockets, you can make foccacia… there are tons of possibilities! Please note that this will look like a LOT of mushrooms for one pizza – but it’s not, I promise. Mushrooms cook down a TON, so you’ll be left with about 1/3 the volume of mushrooms that you started with (see photo below). 2.) Heat a pan over medium heat, and add your olive oil to it. 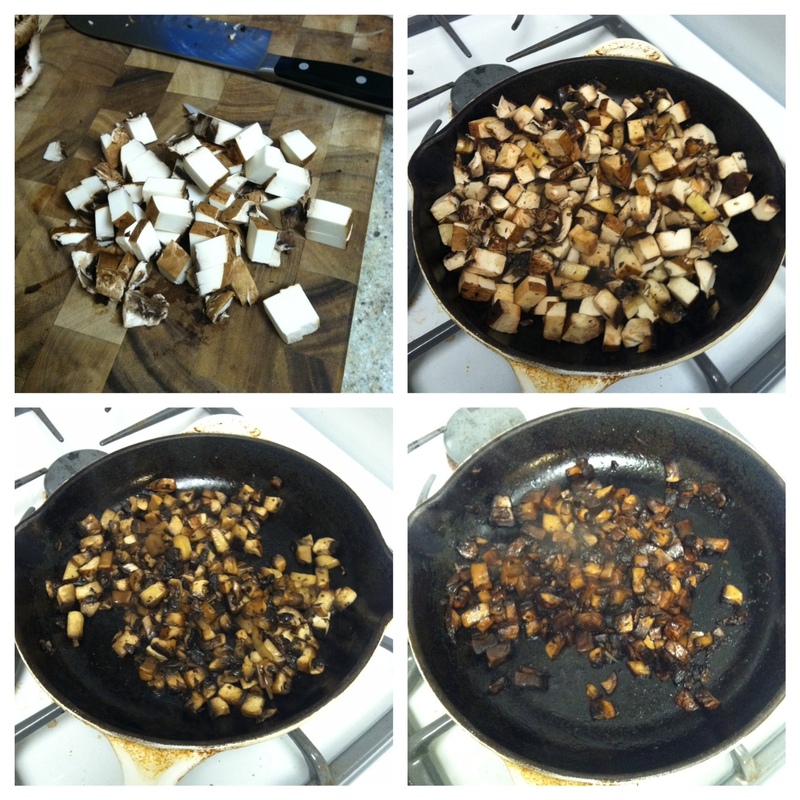 Chop your mushrooms into about a 1/2″ dice, and then add to the pan. Stir everything together, and try to get the mushrooms evenly coated in oil (don’t worry if it looks like some of the mushrooms have sucked up all the oil, and some are really dry – it’ll all even out). DO NOT ADD YOUR SALT AT THIS POINT. Salting the mushrooms too early will make them release their water right away, and they won’t have a chance to get brown. Wait until the mushrooms have a nice brown color to them, and THEN add your salt and pepper. 3.) When your mushrooms are good and brown and have released most of their water, you can add your balsamic vinegar. It will bubble up a bit at first – stir your mushrooms to coat them well, and keep stirring occasionally while the balsamic reduces and coats all the mushrooms. 4.) When there is no liquid left at the bottom of your pan, you’re done! 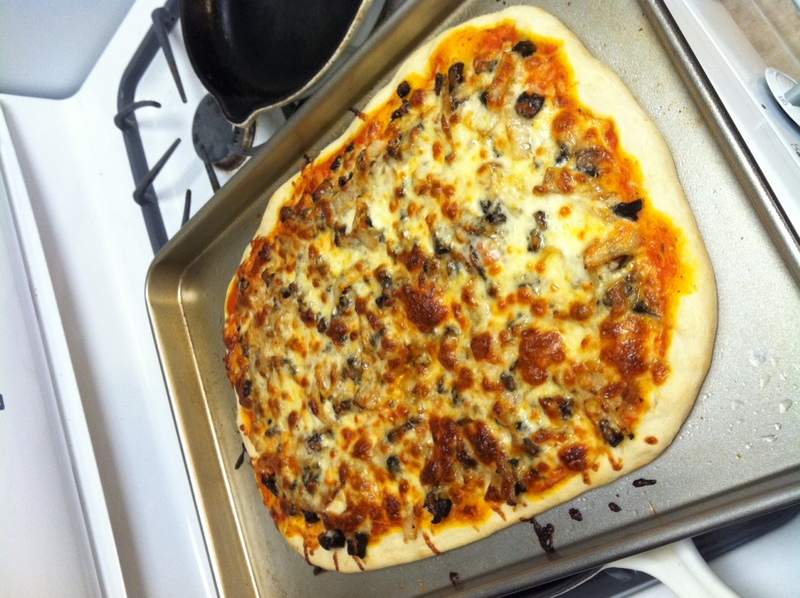 Let the mushrooms cool, and use to top pizzas, salads, in sandwiches, or however you like! So many good ideas in this recipe! And I was looking for a good pizza dough recipe. Thanks ladies!! !